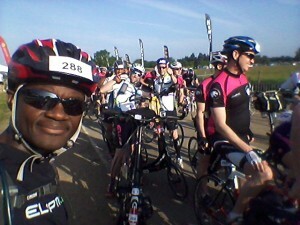 On 1 June 2014 Alan McDonogh, Carl Nanton, Stuart Blofeld and I had all lined up our ElliptiGO bikes (alongside about 2,000 cyclists) for the start of the Chiltern 100 Sportive cycling challenge. 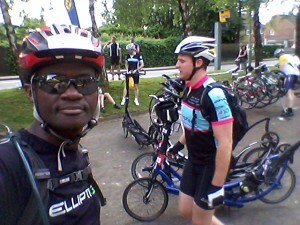 Back in the first week of June 2011, I had completed the Chiltern 100 Sportive, a brutal 110-mile cycling event going through the Chiltern hills with an incredible 9,000 feet plus of climbing and some incredibly steep hill climbs. 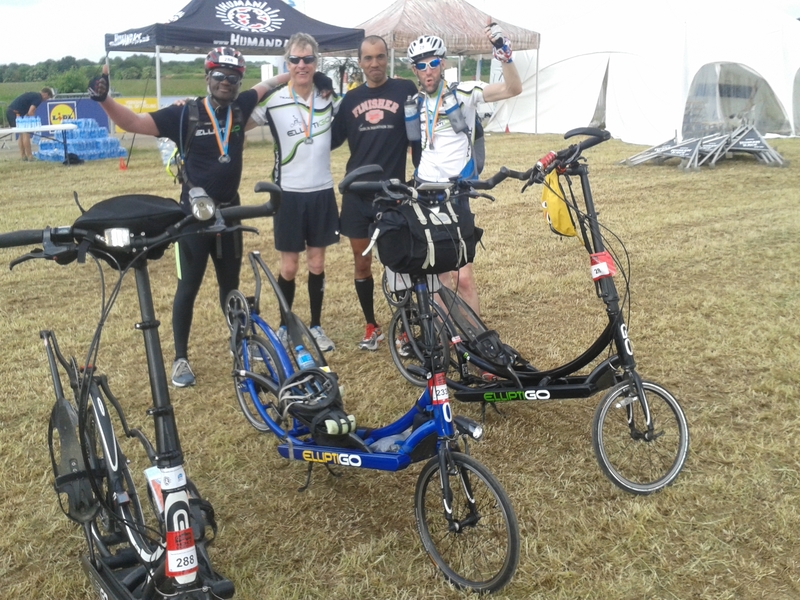 It was my first ever century-distance event on the ElliptiGO and, at the time, was (quite rightly) the toughest and longest physical challenge I had ever subjected myself to. I’m not usually one for doing the same cycling events twice but this one was a ‘special case’ for two reasons. Firstly, the course is not dissimilar to the sort of terrain we are likely to encounter on the 1000km Mille Cymru Audax ride we are training for, so the Chiltern 100 event would make an ideal pacing test. Secondly, back in 2011, the Chiltern 100 was the first (and only) time I had been forced to get off the bike – unable to climb any further – and I had to walk to the top of a hill. That was on a notorious hill climb called Whiteleaf Hill – towards the middle of the Chiltern 100 course. I hadn’t ever got over that disappointment and I knew I would have to return to the course one day to ride it ‘properly’. So that was the other reason I had entered this event. Alan, Stu and I wanted to get a better gauge for our likely Mille Cymru pace and we planned to ride the Chiltern 100 course at our planned long-distance riding intensity, but Carl was just going with the flow and seeing how quickly he could get round the course – so he had pulled away from us within the first few minutes and we didn’t see him again until the finish. It was a really hot day to ride in such a tough event, but there was no wind at all – which didn’t help the heat, but it made the work less strenuous than it ultimately would have been with a breeze. I was keen to compare my Schwalbe Marathon Plus tyres to the thin Continental Racing tyres the other three riders had fitted to their ElliptiGOs. My feeling was that if I observed a meaningful difference in the pace at which they could descend hills it would be enough to convince me to change from the hard-wearing Schwalbe tyres I normally use for maximum puncture protection. The Continental brand claim to have puncture resistance, but the tyres are ever so thin! On the ride Alan got a front wheel puncture at 34-miles in. It was caused by a drawing pin and many a tyre would not have survived it. Carl later reported he’d also had a rear wheel puncture ahead of us. That information, combined with the fact that in the downhill descending tests I was rolling down the hills under gravity at a significantly faster pace than the others, had decided for me that it would be more advantageous to resist punctures than to use thin tyres in the hope that they would reduce rolling resistance. On an ElliptiGO, it appears, weight and wind resistance are the biggest factors affecting efficiency and pace. To prove this point further, I had started streamlining myself when going down some of the bigger and longer descents (by positioning my torso parallel to the road, like a road cyclist) and I was able to reach speeds close to 80 km/hr (my highest speed recorded in those downhill streamlining tests was 43.4 mph – which I do not think has ever been exceeded by anyone on an ElliptiGO)! Impressive for me on this ride was Stuart’s pace – considering he’d already done one lap of the course overnight, before joining the rest of us to do it a second time. He eventually put in a grand total of 212-miles on that vicious course, but was still stronger than the rest of us right up to the end. Stu has been keen that we ride as a group in the Mille Cymru event, but I am not sure it is the best thing to do on a 622-mile course of this nature. He has the pace and should consider using it to his best advantage. Alan and I will be playing it very close in the Mille Cymru ride as we attempt to beat the 75 hour time-limit with our naturally slower pace. 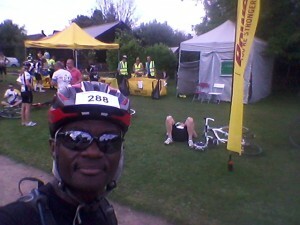 Alan had ridden 50-miles from Northampton to the starting line so he was to ride 160-miles in total. Carl and I were doing ‘just’ the official event distance on this particular day and I do not plan to do any rides longer than 110-miles between this ride and the Mille Cymru ride. Alan and I seem to be pacing very similarly at this stage in our training and our rolling average was 11.6 mph – exactly the same as I had recorded in my 25 hour ride to Brighton and back on the previous weekend. So I think it safe to say 11 mph is likely to be the best average rolling pace for Alan and I on the Mille Cymru ride – much as we had predicted. Whether or not Alan and I will ride together is yet to be decided – because, although our fitness seems to match, we have been training to ride with different approaches. I’ve spent the last 6 months conditioning myself to ride without eating, so that I can save time by avoiding food stops. Alan has been planning a ‘polar opposite’ strategy with regular food and rest stops every 2-3 hours, for the full 3-day event. Having done a large number of long rides I can see the potential value in regular stops to take the pressure off the feet for a few minutes, every couple of hours. So it’s not just about eating when one plans stops on a very long and tough ride like the Mille Cymru Audax – and I could potentially use some of that stationary time (if I decide to use Alan’s planned strategy) to document various things and to send out live updates. We will definitely need to come to an agreement on all the timings if we are to find a joint riding strategy which all three of us believe in – and belief in the strategy is crucial for such a tough event. I am strongly leaning towards riding it with Alan, because having company on such a tough ride really helps keep you going – and keeps things more enjoyable (and enjoyment improves performance)! The fact that Alan and I currently seem to ride at a similar pace further pushes me into that train of thought, but all three of us will need to formalise it quite soon and we’ll all need to think it through clearly over the next few days and commit to a concrete plan of action (at the time of doing the Chiltern 100 ride the three of us still weren’t completely certain about how to approach the Mille Cymru riding plan)! 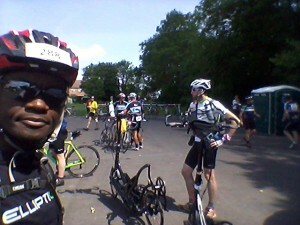 The Chiltern ride progressed well, but still felt brutally hard, even at long-distance event pace. The heat was unbearable and the hills were just as imposing as I had remembered them. This time around I am a much more experienced athlete and getting over those enormous hills wasn’t in question at any stage of the event. But the course is ‘sadistically’ designed – with some of the most unbelievable climbs incorporated in regular succession. On the famed Whiteleaf Hill Stuart had sprinted up at an unbelievable pace, overtaking all the other cyclists around us, whilst Alan and I had just used our lowest gear ratios and climbed slowly, but steadily. On Whiteleaf Hill I had seen two cyclists actually stall and fall into the road on the steepest part of the hill, simply too exhausted to unclip their shoes before they had hit the ground. In the latter part of the course some riders were really tired and those who had paced wrongly (like I had done in 2011), or those who had not done sufficient training, were totally faded. Many of the cyclists around us in the later stages were the slower riders (when compared to the average road cyclist entering an event of this nature) and they were often forced to walk up the steeper hills towards the end of the ride. Some of the guys who fell off their bikes on the big hills had given me a real scare because there were oncoming motor vehicles driving past us – many of which were being driven impatiently and carelessly. I hope nobody was seriously hurt during the event – although we did regularly see ambulances rushing around with their sirens blasting, which can’t have been a good sign. I’d noticed that even though we were riding up all those steep hills we were often not going too much faster than the guys who were walking up the steepest parts of the hills! But I know from my 2011 experience that pushing the ElliptiGO up a hill is often harder than riding it up the same hill – because the motions of walking or riding the ElliptiGO are almost the same (but when walking the weight is not balanced, as you need to stand on one side of the bike to push it). The stats for this ride can be seen on this link. We were stationary with the puncture repairs, or at food and drink stations, for 50 minutes in total. As is normal for me, I didn’t eat before or during the ride – I just drank water and took the occasional salt and caffeine tablet to maintain electrolyte levels in the blazing sunshine. My effort was probably more managed on this ride than in the previous week’s ride to Brighton and my highest heart rate recording for the Chiltern 100 was 165 bpm, which for me is a good demonstration of effort control. The End - finally... (LR - Idai, Alan, Carl and Stu).